HERNING, Denmark – MCH Group recently installed a complete audio and lighting solution from HARMAN Professional Solutions in the newly built visitor’s foyer at Jyske Bank Boxen Arena in Herning, Denmark. The Jyske Bank Boxen is a 15,000-seat indoor arena that hosts sporting events such as ice hockey and basketball, as well as concert events with international artists. 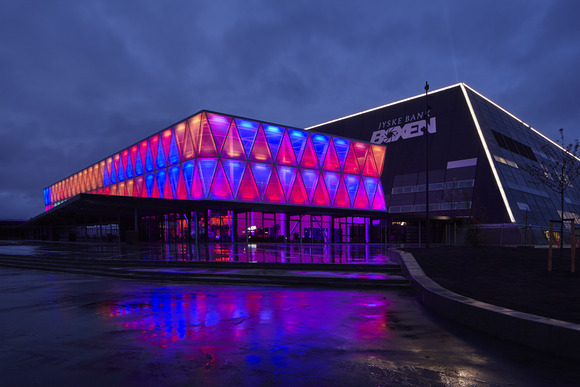 Jyske Bank Boxen is part of the MCH Messecenter Herning exhibition center in Herning, Denmark. In preparation for the 2018 International Ice Hockey Foundation (IIHF) World Championships, the MCH Messecenter Herning opened a new visitor foyer, featuring a dynamic façade designed to direct visitors to the arena, exhibition halls and other areas of the complex. In order to deliver a memorable experience for guests at the area, MCH installed a complete audio and lighting solution from HARMAN Professional Solutions, made up of Martin, JBL, BSS and Crown.